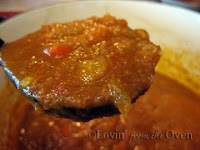 Frieda Loves Bread: The Boss is Coming Over for Lunch: Company Pot Roast to the Rescue! 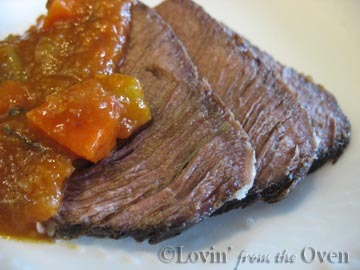 6 The Boss is Coming Over for Lunch: Company Pot Roast to the Rescue! Looking at my purple-stained hands, I frantically searched my brain..."what can I make?" and remembered that I purchased a boneless chuck roast at Winco. 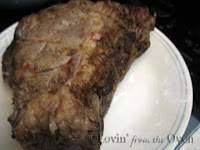 A chuck roast is full of connective tissue and collagen. If cooked correctly (low and slow), the collagen partially melts, making the flavor intensely stronger. I've eaten a pot roast or two in my life where I have wondered...."How long do I have to chew this before I can swallow?" or "what's that piece of gristle I just ate...?" 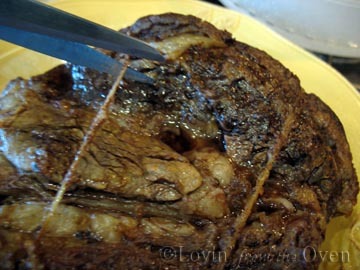 Tie the roast with string, pat it dry and lightly use sea salt all around it, and let it sit overnight in the fridge. What? Salt meat before cooking? I've heard that salt takes the moisture out of meat, but have just recently learned that the salt, from a purely scientific view, helps the meat cells hold on to water, resulting in a juicier piece of meat. The further ahead that you season the meat, the better the distribution of the seasonings throughout the meat. An experiment of salting meat before/after can be found HERE. The next day, the meat is dredged in all purpose flour, pepper and nicely browned on each side in a little bit of oil. I love my dutch oven that I bought at Sam's Club and just saw a 6qt. one at Costco for $49 ~ a must for any cook. It keeps the foods hot for a long, long time. Carrots, onions, celery and garlic are sauteed in a little bit more oil over medium heat for 10-15 minutes. Don't forget to scrape up those rusty brown bits. 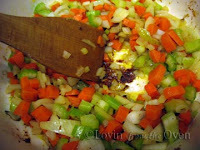 This recipe also calls for Burgundy Red wine and Cognac, but I prefer to not cook with alcohol. 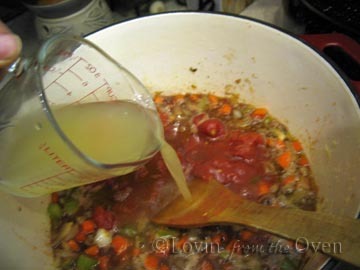 Cooking wine and chicken stock are poured over the tomatoes and veggies. 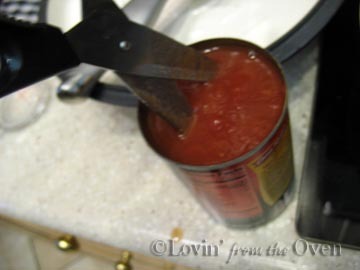 I LOVE using McCormick's chicken base. Very fresh and very easy to use. I dug this rosemary from my freezer in a vacuum sealed pouch. 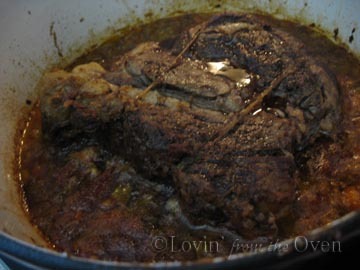 The browned roast is put on top of the sauce, brought to a boil, covered and put into the oven. Another reason I love my dutch oven. Goes from stove top to oven easily. This is baked at 325ºF for 1 hour. The temperature is then reduced to 250ºF for another hour and a half. Here, you can see how much more the meat has browned, the sauce has thickened and caramelized. The roast is taken out, the strings are cut and discarded. Remove the rosemary and skim off as much of the fat as you can from the top of the sauce. 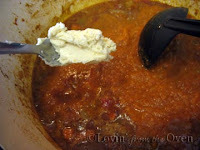 Ladle half of the sauce into another pan and puree it until smooth. I love my immersion blender ($10 at a Kitchen Collection Outlet) ~ if you don't have one, use a blender or food processor. 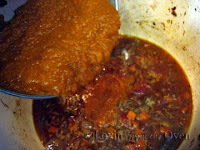 Transfer the pureed sauce back into the pot of veggies. Return the sauce to a low simmer. Make a "paste" by mashing flour and butter and stir this in. After a couple of minutes, you'll have this. Slice the meat against the grain for perfect thin slices; or with the grain if you prefer a shredded beef. Serve with the sauce. Holy moly...eyes roll back into the head yumminess. Worth a second and a third helping. The boss loved it. My hubby loved it. My son said, "make it again." Want a knock~your~socks off Shepherd's Pie? Shred up the beef, add some green beans to the sauce and mix it in a skillet. Dollop mashed potatoes on top and sprinkle with some cheddar cheese. Cook until cheese is all melty, bubbly and gooey. I brought this over to my mom and dad, who loved every morsel. Frieda, I love pot roast! Ina Garten is always a trustworthy source. I'm not so sure I'd put cognac in my pot roast, but red wine sounds worth a try (I've never used wine in my pot roast before). 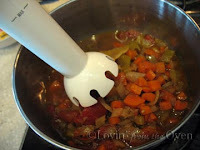 Do you own a pressure cooker? I've made pot roast in less than an hour this way. It really does produce very tender meant-- though I still sear the meat first. Comfort food season is definitely on it's way in California. I'm looking forward to it. 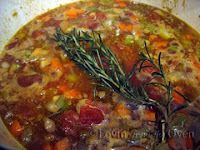 Deby, I left out the cognac and used a cooking wine in this recipe. 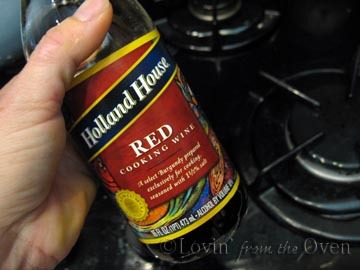 The cooking wine does not have alcohol in it, and you should try it. While the pressure cooker pot roast was fast, easy, and moist, Ina's Company Pot Roast was by far much, much better. I had read about that salting-the-meat trick somewhere else before... can't remember where, and now I'm anxious to try it. I'm a slow-cooker roast gal myself, but imagine that the rest of the principles and ingredients would remain the same. 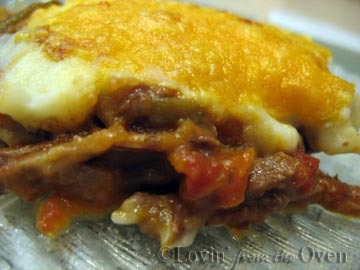 Looks delicious with the taters and cheese on top! I tried this the other night in my crockpot with a cross rib roast and it was FABULOUS! I also did a post on my blog about it and put your link in. Thanks! Kelli, I'm glad you enjoyed it! Thank's so much for sending me the link to your post! 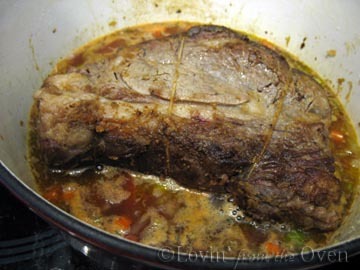 I can't wait to try this pot roast, it looks sooo good!